Another day, another handknit. The level of production around here is downright disgusting. It’s nearing sweatshop conditions, I tell you. Okay, not really. Please remember that all these knitted things I’m showing you were finished over the last few months. 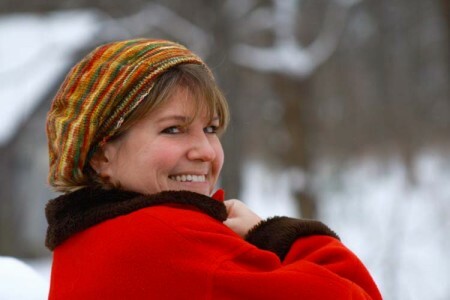 Today’s item is a great little beret designed by the fabulous Kirsten at Through the Loops. Can I just tell you – I want to knit everything she designs! Hats, mittens, sweaters, vests – I love them all. So this beret is called the “One Day Beret” but that doesn’t really apply when you knit it with sock yarn. Which is what I did. Turns out, when you knit this with sock yarn, it’s actually a One Week Beret. All I can say is that it seemed like a good idea at the time. You see, there I was, standing in front of the yarn stash, holding up my red coat to see what would match. This Numma Numma Toasty in the color Bruschetta just jumped right off the shelf. It matched so perfectly that I didn’t give myself a chance to consider the consequences of a beret on size 2 needles – I just cast on immediately. While I’m not much of a hat person, sometimes you just need a hat. 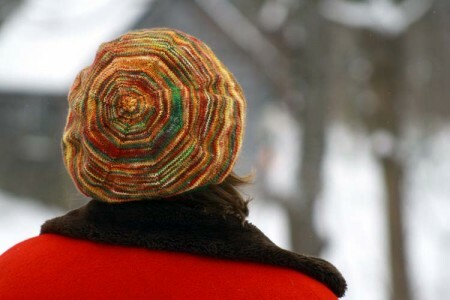 And we’ve had a lot of those sometimes this winter – brrrrr – so I’m really glad I made myself this beret. Can’t you tell by my smile? Or am I really thinking, hurry up and take the damn picture so I can go back in the house where it’s warm? You decide! I love the beret. We could use a little of the cold and wet out here in CA. Upwards of 75 degrees and sunny today–Is it January or JUNE?!?!? I can’t knit in these conditions!! I know it sounds as though I’m kidding, but I’m not. It’s too darn hot for JANUARY! It’s amazing to me how many of you Not Hat People look so fantastic in hats. I love the colors in your beret. The only hats I will make for me are Berets and I actually wear them. I made a One Day Beret this summer but haven’t decided yet if I will keep it or give it to a friend. I love that colorway! Looks so pretty in a hat. I vote for the latter. It IS a good match, and yes, hats are one of the keys to a successfully survived winter! Sooooo cute! Totally worth the time investment! Oh I love it!! Such a beautiful look with your coat. You have once more inspired me to keep those needles busy!! That’s a great picture of you! Well, my goodness, that is such a stinking cute picture! Whatever you’re thinking.